If there is any movie that people wait for years is the one in which Aamir Khan is involved as an actor or maker. One such movie which was regularly been talked of post-Dangal was “Thugs of Hindostan”. More because it was bringing Aamir Khan and Amitabh Bachchan together for the first time and that too under the banner of Yash Raj films. Over this, it involved Katrina Kaif and the Dangal-fame, Fatima Sana Shaikh too. What more is needed by the Bollywood movie lovers than such assembles of great star-casts and a big banner. After watching the movie, every curious movie lover like me has been disappointed seeing such an extravagant and over-hyped film being treated so badly that the screenplay and writing had no potential at all. Even the dialogues are such that not a single one of them stays with you after you move out of your seat. Not only dialogues, even the music and songs are such that despite the movie having 2 item songs and couple of motivational songs used during fighting scenes, none of them impresses your ears enough to become a part of your playlist. Talking about the locations, yes, they are mind-blowing and only thing which matched with the film’s outset. Talking about the action scenes, there are few good minute fighting details captured during the fight segments on yacht but the ones including Fatima Shaikh are silly and laughable. 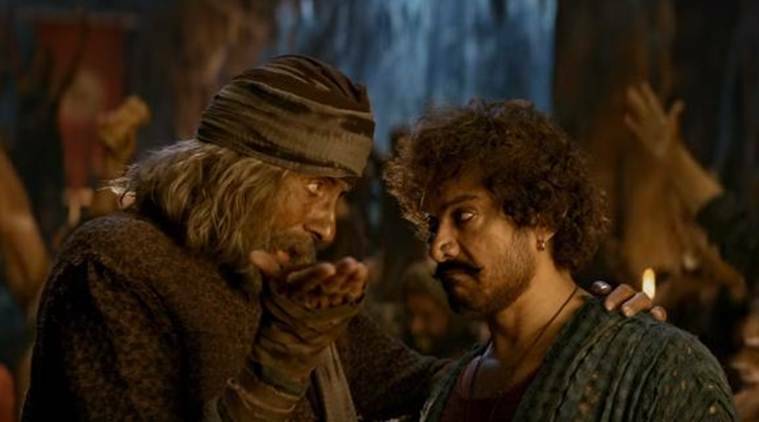 Talking about the performances, Aamir Khan and Amitabh Bachchan has at least acted their part well which was bearable but nowhere it seems that they have put an extra effort in making their characters look extra special. It is like just another good performance out of many whereas it is expected from such a big banner and actors to bring out their best ever in such collaborations. Katrina Kaif has disappointed with her role selection in this movie. After working for more than 15 years and being part of many big movies, how can she sign a movie where she has just 2 item songs and nothing else to do? Embarrassing! Talking about Fatima, she is nowhere close to her performance in Dangal. She has tried a lot to be different but ended up being nothing. No role from any supporting actor is worth mentioning at all. This movie should have been made as a thriller but the problem here is that everything is so straight that you will end up predicting right every next scene. Even when death of one character is shown, you know within that he will come back later on. With such baseless and weak plot, there is not much that can be talked about. It is very strictly a one-time watch which can also be skipped. I give this movie 2 stars out of 5.